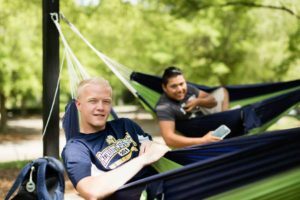 Reinhardt University has embraces its students’ enthusiasm for hammocks. The hammocking culture among students is a reflection of the overall culture at RU. RU has a very relaxed feel to it, and that’s something that hammocking plays into perfectly. Hammocking allows students to spend more time outside and is a great place to get class reading done, as long as you don’t mind interrupting it with a little nap that is bound to happen. A 2011 study by Michel Muhlethaler on hammocks, sleep and brainwaves and found that hammock users experienced various health benefits. According to Muhlethaler’s findings, the rocking movements of a hammock synchronize brain waves, leading to a deeper sleep. This deep sleep leads to an improved mood. A sharper mental performance and better memory can also result from deeper sleep. Muhlethaler also includes a faster sleep onset and possible cure for insomnia among the benefits of using a hammock. There are four sets of hammock pods around campus. Pods can be found beside Gordy Hall, behind the Donor Plaza near the shade garden, overlooking the waterfalls by Lake Mullinex, and next to the sand volleyball court. Hammocks are available for check out from Reinhardt Central, compliments of the Student Government Association.